SAN IGNACIO/SANTA ELENA/ BENQUE, Thurs. Mar. 5, 2015–In the western twin towns of San Ignacio/Santa Elena, the parade of the United Democratic Party’s (UDP) red T-shirts and the Opposition People’s United Party’s (PUP) blue T-shirts was on constant display in the streets and at the polling areas where residents went to cast ballots in Wednesday’s municipal election. In the far-flung western town of Benque Viejo Del Carmen, it was the same scene, with the political machinery of the two major parties in full gear. On the Bullet Tree Road leading out of San Ignacio towards Benque Viejo, the constant flow of vehicles decorated in the party colors of the UDP and PUP tell the story of the intense competition between the red and the blue for the prize of victory at the polls. In Polling Area #73, the PUP mayoral candidate Ramon “Munchie” Quiroz was on a roll, greeting voters as they entered and left the polling area. Quiroz, however, was keeping watch on a house in front of the polling area where UDP operatives were allegedly paying voters. Quiroz told Amandala that his campaign started about 10 months ago. “We walked the entire San Ignacio and Santa Elena, and I can tell you people are fed up of the same rhetoric. They have been promised many things by this administration. 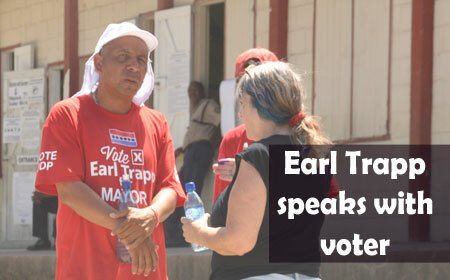 The UDP’s mayoral candidate Earl Trapp expressed some concern about the low voter turnout as the polling reached the halfway mark in the early afternoon. With respect to the apparent low voter turnout in San Ignacio, Trapp told Amandala that he attributed the low turnout to the heat and the time of the day. Asked what his feelings were about his and his party’s prospects of winning the elections, Trapp shot back: “I can tell you that I feel very confident that it will be an overwhelming victory for me and my team. Out of the 12,676 registered voters in the twin towns, 7,364 – or 58 percent- cast ballots, and there was a decisive victory for Trapp and his team of town council candidates. “The time and the work that we have done make us feel positive. We will continue with the transformation that is already taking place, such as cementing the streets and the drainage. One of the biggest projects we have right now is the football stadium, which will be constructed to FIFA standards”, Ramcharan said. “After winning the elections, we will be making sure we have the town clean and we will be working hand in hand with the people,” Ramcharan said. 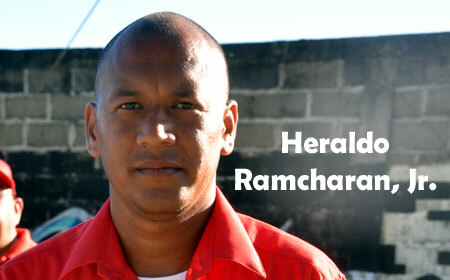 Ramcharan said that the issue of jobs for Benque Viejo residents is being taken care of by Hon. Erwin Contreras, so they are not in the same position as the people in San Ignacio/Santa Elena who have to leave their towns in search of employment elsewhere in the country. Benque Viejo tied with San Pedro for third place with its 66 percent voter turnout; 3,037 voters cast ballots out of the registered amount of 4,575 voters.